Deserted by the pack when she was a child, rogue, Kacie Marks is used to defending herself, and she’s happy to keep doing so, even when vampires invade her woods. However, rogue hunter, Bryce Kinkaid has other plans for her, plans that involve using Kacie as bait for the vampires intent on destroying every werewolf they can find. Kacie evades both vampires and Bryce at first, but the rogue hunter isn’t one to give up. Especially after he gets close enough to Kacie to realize she means much more to his wolf than just bait in his vampire trap. 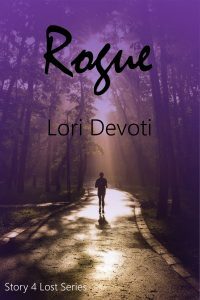 Rogue is the fourth short story in the Lost series of vampire and werewolf romances. If in print, it would be about 65 pages long. See Lost and Found, stories 1 and 2, in the series.